Today I had the pleasure of going with my husband, his mother and her sister to an inland area of Bahia called Lamarão (which literally means "big mud") in the county of Camaçari. Ever since the U.S. election I've felt especially disgusted with the world as I know it, and have sought time and places to reflect on how people can live and really investigate the various ways people are living right now. Pretty much since moving to Salvador over 6 months ago I've had a hard time with city life here. I've never actually lived in the heart of a big city, so my discontent might be linked to my own non-urban preferences. But Salvador presents particular challenges and environmental concerns that have been making me feel anxious and sometimes ill (emotionally, physically or both). I often feel like I cannot find a place to escape cars and traffic, knowing there are more efficient means of transportation. The water we use in the city is desalinated, and even filtered has an unpleasant taste and sometimes causes stomach problems. I witness daily the smells and sights of massive open sewage rivers that flow untreated directly into the ocean at various points throughout the city. I see people entering that same ocean as if there were no care in the world. Every day I have to throw away all of my trash in the same bin outside, which provides no recycling options (I've learned that some people buy large amounts of particular materials, so have started hoarding them in my own house, but I know nobody else who takes the time to do something like this). I see restaurants serving excessive varieties and quantities of meat as a form of luxury and leisure, and people worshipping or addicted to products from U.S. companies and chains like McDonalds and Coca-Cola (which owns alarming amounts of the fresh water sources in Brazil, and throughout the world). 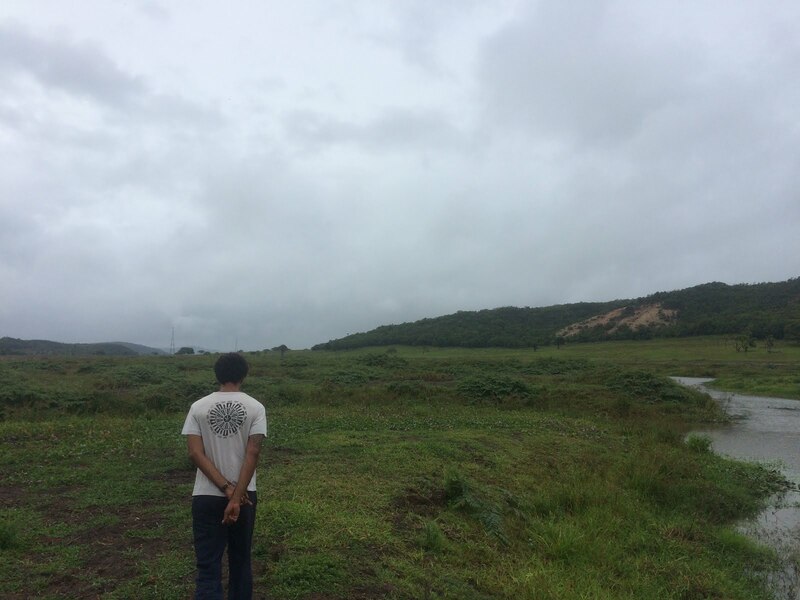 Through my near 6 year engagement with Bahia, I've seen multiple rivers shrink drastically or disappear altogether. I've heard terrible stories of intoxicated fish and water, fishermen out of work, communities going hungry and moving to the city, of rivers filled in for development overnight with no notice, of land invasions from private companies and land developers in previously sustainable and autonomous communities. Although Brazil has many of the most fertile places in the world, what I most often see is destruction and exploitation of land and people to get at those resources. It's a plunge export economy (always has been). It's run by crooks, with allies in the U.S. (I don't have the energy to give a summary of Brazilian politics right now, but trust me the corruption, bribery and unethical behavior is hard to fathom even in a post-Trump world). I've been reflecting on the immense importance of the struggle at Standing Rock, reading about Trump's energy and land policies, considering how simple and effective it is for those with power (guns, money, laws, organization, administration, etc.) to transform landscapes, lives, and futures. The short-sightedness of an oil or coal-based energy system that fuels the global production of low quality, simple products by multi-national companies who have no regard for the environment is highly alarming. I know there are other ways to live, and I know that many people in the world today are still able to live mostly independent of these corporate, urban traps in perhaps small, but important ways. We cannot lose sight of those forms of life and have to learn from them. So today we went to the countryside. Leaving the city always allows me to breath a bit better. I feel encouraged by the forests that still exist, by the water that still flows. Going with my mother-in-law, her sister and my 27 year-old husband allowed me to get their perspectives on the changes in the region. It also helped me reflect on how memories are tied to places, and how oral histories can be told to reconstruct certain versions of the world that seem currently lost or inaccessible. This is the same method I've used in interviewing Candomblé leaders and members, and it has given me access to past experiences that humans are particularly apt at recalling and describing in ways that allow for the mind to imagine a different version of the world. I believe this form of history-telling is useful both for understanding the past, and building the future (and know that many other cultures have cultivated and continue this practice). Their first comment upon our arrival to the region was their horror at the dried river. I could have predicted this as the general trend in Bahia and Brazil, but their responses and descriptions of the way things used to be still gave me anxiety and dread. They explained that the entire valley used to be filled with water, and that they would go swimming under the bridge we drove over, where now I could barely identify a stream. The bridge, however, was exactly the same precarious structure as decades ago, and they all shook their heads condemning the mayor for not doing something about it. We arrived at one of their old friends' house and once again we could breath easy. Despite not talking for years (no cell service there), Jorge and Kátia embraced all of us and immediately started feeding us organic fruits and vegetables from their humble, but dynamic garden. People have been living "sustainably" by the river for hundreds of years, and do not rely on supermarkets or packaged, industrial food to survive. All of their water is free and natural from the nearby water source. When I asked about the river, Jorge seemed unconcerned. He simply stated that it had been a dry year, and it gave me some hope that the river would come back and some dam or company wouldn't privatize or pollute it all. Despite this years' dryness, we visited on a rainy day. It felt like a sign of hope and resilience, and Jorge's tranquility eased my anxieties. One thing I've come to know in Brazil is that the people who have the least share the most. I've pushed myself to be more generous in so many aspects of my life because I admire immensely this trait, and know it's the right way to be. I often find that people with money are obsessed with keeping it and being "fair", evaluating what others have and what they can contribute (I am totally guilty of this). But often when I arrive in the most simple, humble places, I am met with the most selflessness and generosity. 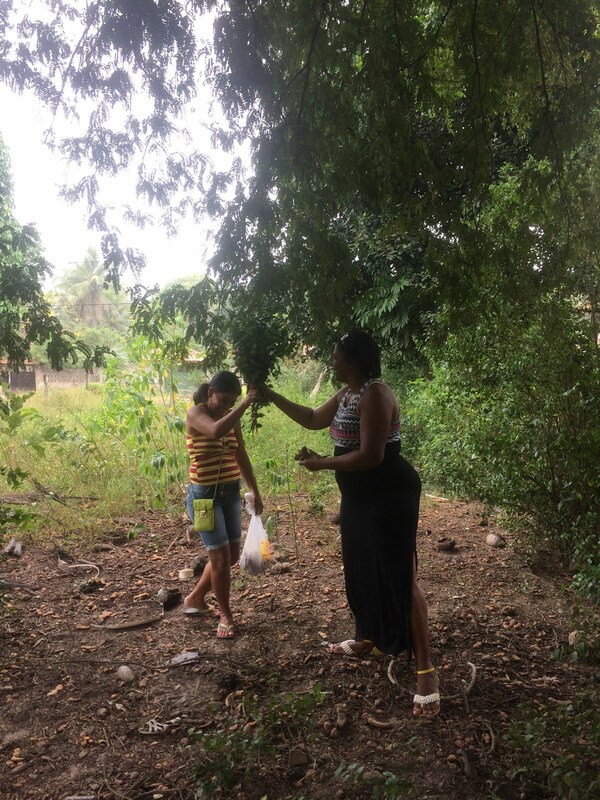 By the end of our time roaming around, picking fruits and knocking them down from tall trees, I learned that although people encircle their land with fences and property titles, the plants reproduce themselves and spread in uncontrollable ways; branches spread and fruits fall where they may. We went around collecting the spring's bounty. There are so many different fruits here that I had never encountered before getting to know Brazil (and I am constantly learning of new ones). We picked them from the trees, or off the ground and sucked on them. 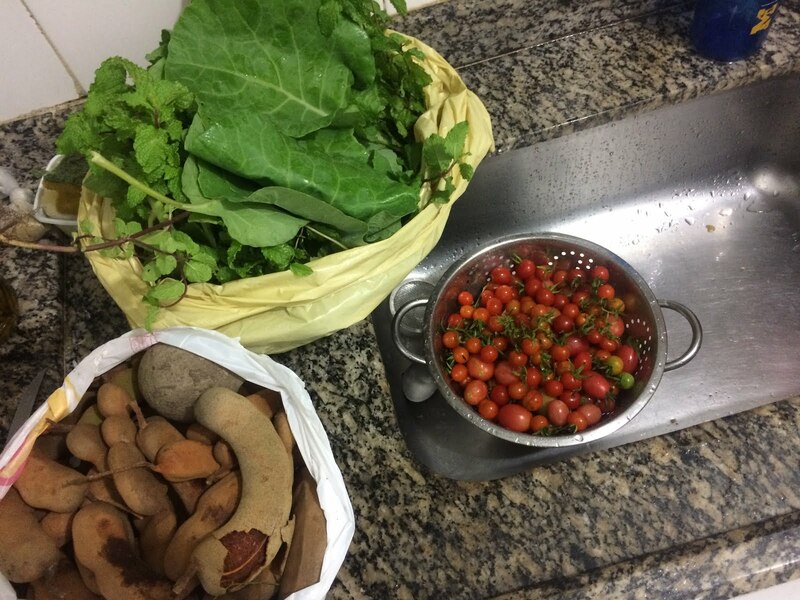 I savored their unique, sometimes sour or tart flavors, and considered a world where people were happy with just this, rather than rushing to pour sugar into everything (and Bahia is the heart of sugar culture because of the long history of slavery and sugar production). Some of the things we ate and came home with include cocoa (the fruit, not just the bean), mangoes, papayas, mint, kale, cilantro, and cherry tomatoes. Jorge was also willing to give us seedlings of trees and plants for us to plant. My husband and I happily accepted, hopeful that we too could continue the legacy of that particular plant and all it has to offer. 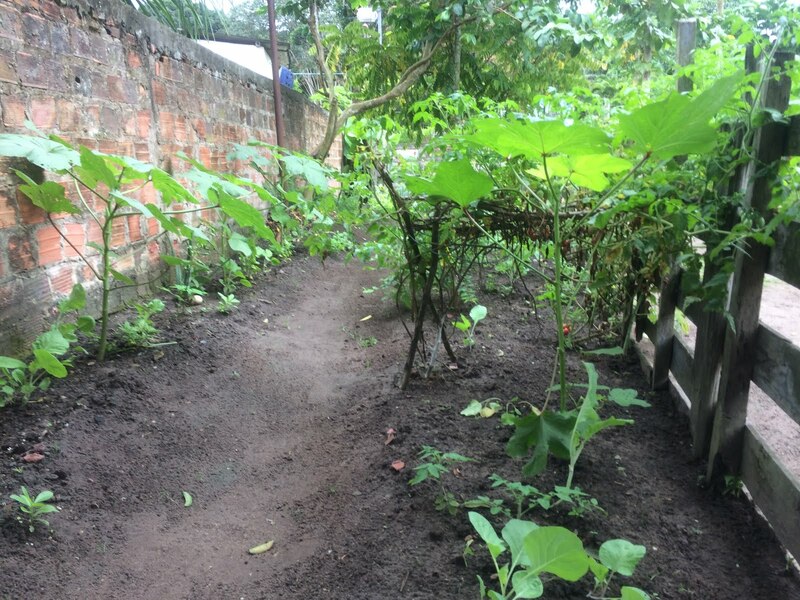 I believe that gardening in Brazil is the most practical way to escape from much of the above problems, especially because most everything grows here with very little maintenance or input. The fact that the majority of people now live in cities and have been so distanced from this practice is a shame and cause for alarm, but not an irreversible problem. The resilience of plants and their reproductive power cannot be underestimated. In a world of Monsanto and corn-based everything, of privatized water and plastic wrap, today I felt encouraged that the natural world knows how to survive in ways we are often too short-sighted or distracted to respect and cultivate. I know that this realization isn't revolutionary for most, and that so many people have been working to get back to the land, to incentivize urban gardening, organic and sustainable production and consumption. However, my exposure to that culture (especially in California) has often been what we might call "bougie" and largely inaccessible. In Brazil I see people hungry for the lifestyle the U.S. has to offer. People are often jealous or in awe at the fact that I speak English, have many apple products, and assume that I live like in the movies. I fear that many places in the world wish to follow in the U.S.'s footsteps, and forget to look internally at the solutions they have to problems the U.S. largely created. I know that U.S. investment, capital and technology are seductive and often profitable for a few who have the decision-making powers, but I also know that in so many situations they are destructive, indulgent and unnecessary. I am inspired by those who are not seduced, who know how to live on their own terms and who are hopeful. Going forward, I believe they will be my role models.